I have been designing and developing this large garden in Esher for some years, in the style of a typical and relaxed ‘English country garden’. The client had two particular problems early on: unsightly access covers, and an awkward level change between two lawns. To disguise the man-hole covers, a herb garden was built with raised walls and a trap door in the decking floor to allow access. It is now a favourite reading spot in a quiet part of the garden. 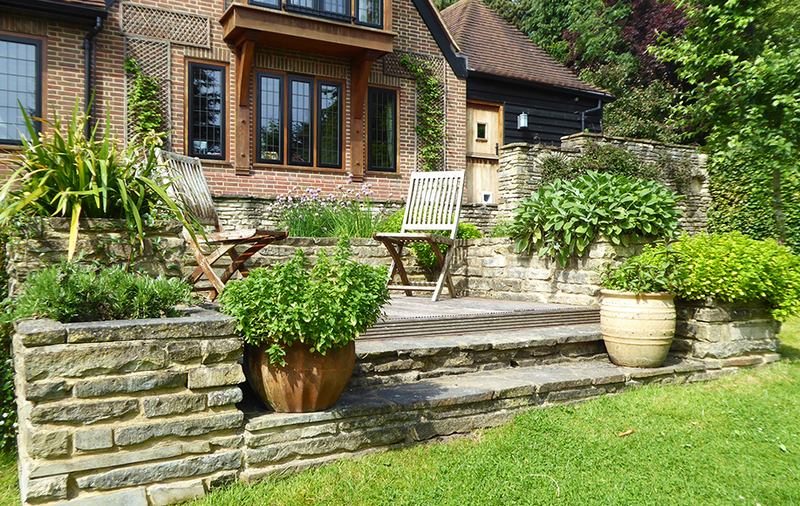 To improve the look of the split-level lawns, a low retaining wall and steps were designed, with planting that had seasonal interest. This included Cornus and grasses for winter, spring bulbs, and summer perennials such as Sedum and Hemerocallis.